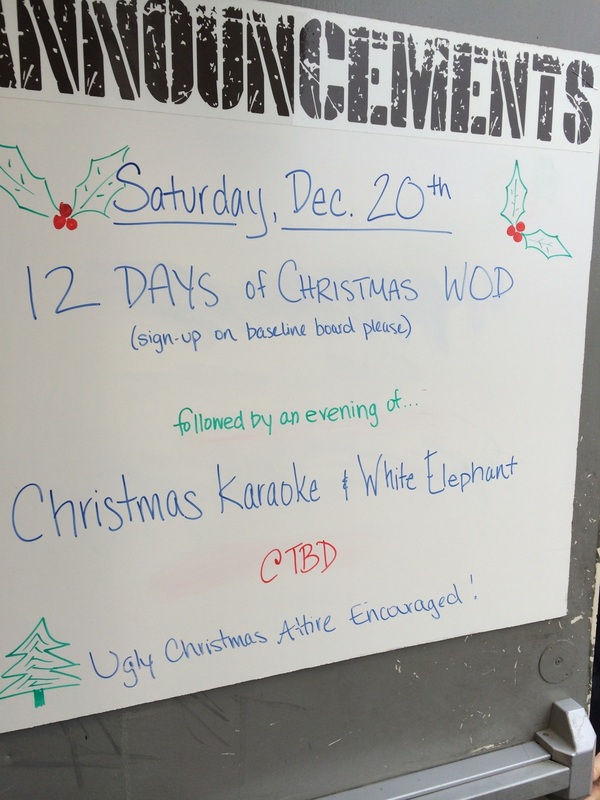 12 days of Christmas WOD and more. Our annual 12 days of Christmas workout will be on Saturday, December 20th starting with heats at 8am. Each heat will be for 30 minutes, so be sure to sign up for a slot on the board at the gym. Saturday night everyone is then invited to a night of karaoke and a white elephant gift exchange. Details will be posted at the gym. Please also check the Front Desk schedule for classes around Christmas and New Years as some changes have been made. We will post times at the gym as well. Lastly Crossfit Green Bay hosts a competiton called the Ice Bowl that we have brought many members to in the past and we would like to keep that tradition. There are scaled, Rx'd, and masters categories. In the past we have spent Friday and Saturday in Green Bay at a hotel near their gym. If you'd like more information let Scott or Alison know! We are looking for February for our next Crosstown Throwdown as well. We will keep everyone posted!